Calving season has begun! New babies are everywhere all of a sudden. 99% of them are born out in the field with no problems, but every once in awhile, we need to help out for some reason. 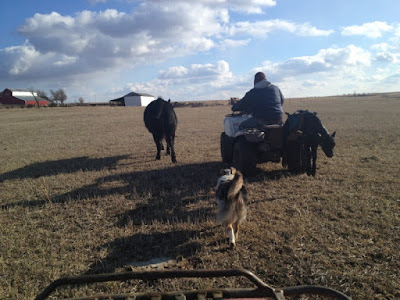 When we do help out, it means that we need to walk the cow and her new, slimy, slippery, smelly and cold baby in to the barnyard nearly a mile away. Carrying the calf is difficult enough, but the mama wants to be with her baby, and if you put it in the front of the pickup truck with you, she can't see it. If you put it on the back of the truck, you can't see the calf to make sure it doesn't fall off! This little calf carrier solves both of those problems! The calf can ride in comfort, and you can see him to make sure he is safe, and mama can see him and follow you right to the barn. This mama cow is actually a heifer--which means that this is her first calf. She had a beautiful warm day to calve, but as soon as she had her baby, she hopped up and ran off! There are new moms who would like to do that, but once the mothering hormones kick in, we all fall in love with that slimy little baby. She didn't give her calf enough time for her to fall in love with it. So we had to gather them both up and walk them in to the barnyard. We penned them together in a small pen where she couldn't get away from her calf and she finally realized that this was her baby and began calling to him and licking him clean. Eventually, she realized she loves him and let him nurse. Usually, this is what we find. When I checked the heifers in the early afternoon, this mama was in the throes of labor and was lying out pushing for all she was worth! The next time I went out to check on her and make sure everything went well, I found her licking and calling to a brand new little bull calf. He had not stood up yet, but she was doing her job well and he soon was on his feet, looking for milk. Mother Nature is pretty amazing and very rarely do we have to help out. I "found" you by watching Sunflower Journeys today. Now I'll start following your blog - after going back & reading previous ones. My friend owns a cattle ranch in Bedford, PA so it's interesting seeing another perspective of the cattle business. Martha! So glad you looked for me! Thanks for coming to visit the blog...and I just love Sunflower Journeys. I have watched that show for many years and it is an honor to have been on it! We have started calving too. Today Richard found a newborn calf that had fell down a hill and was in the ditch. He was still wet and probably would have died if he had not found him when he did. He carried him up to his Mom and everything was fine. Another month old calf wasn't with her Mom this morning and we feared something had happened to her but she showed up later. Probably just laying in the sun. Busy time around here. The sun is nice, but it does kind of make things crazy as the cows and calves don't really stick together. We have only about 30 calves so far, but we will be hitting some busy days soon with more than 10-12 born a day! I'm sure they're waiting for the storm predicted later this week! 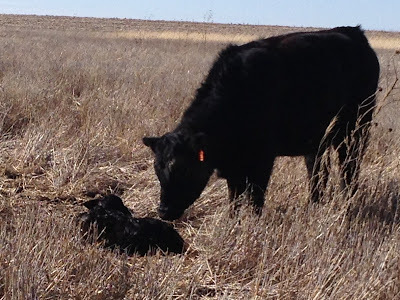 There are pros and cons to fall calving, just as there are for spring calving! We have considered it and have chosen to stick with spring for the time being. Just one of the many perks to running your own business--making those decisions yourself that fit your needs! Thanks for your comment and keep in touch!! It makes me so happy to see the calves dropping all over the place! We don't start until March, and even then we won't have many as many of our cows who should have gotten pregnant this summer didn't because of how skinny they were during the drought. We calve twice a year though, so we should have an abundance next fall! I love your calf carrier - so smart and so much easier than trying to hold him on your lab and drive the four wheeler, which is what we end up doing! I kind of wish we didn't start until March this year! What a terrible end to February with the blizzard last week and another predicted tomorrow night! It is great to connect with you! I look forward to your blog!